Books are essential tools for education and to empower the educated. With the advent of technology, the very foundation of reading has changed. Along with an increase in the number of electronic devices in the previous decade, the number of e-books has also increased. Books are now available in all three formats of content - text, audio and video as well. But how is a digital textbook better than a paper textbook? Let us find out. E-books are lighter in comparison to print books. Electronic books are easy to carry around and have greater storage capabilities. A single Kindle or Mobile device or a laptop can store up to a 1,000 books with great ease. 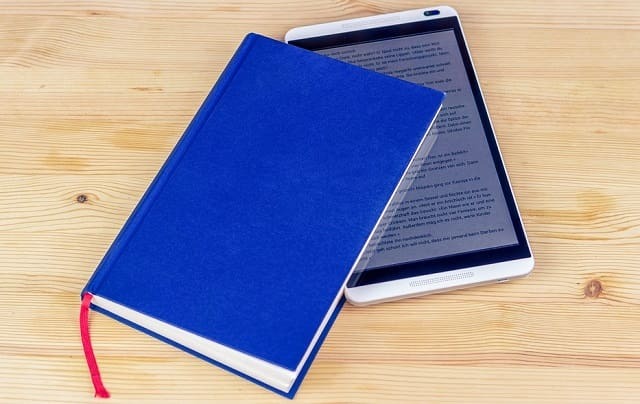 A student who might be preparing for an extensive exam such as GATE or CAT might find it easier to store digital textbooks in their mobiles / laptops than to fill their room or bags with heavy and large paperback textbooks. The compact nature of these devices not only helps with greater storage but also helps in reducing the burden upon students to carry hefty and bulky books around. It can't be understated how much discomfort and back pain a backpack full of books can cause a student over the period of years or decades. Digital books are just a healthier choice. New age digital textbooks are highly durable. Usually, when it comes to a paper textbook, utmost care has to be taken. Care must be taken so as that it does not get tampered or spoiled. Paper books are prone to spoilage by dust, rain or harsh weather. Digital textbooks or E-Books are not inclined to such wear and tear. Even if any of these devices DO get worn due to any external factors, the data inside these devices would be intact and can be easily retrieved into another device. This makes a digital book provide a higher value for money. While paper-based textbooks are limited to their usage of reading, making notes, highlighting or bookmarking, digital books can do all of those in a much simpler manner. ( Additionally, e-books even let you search for specific terms, enable night time reading and allow you to look up difficult words or synonyms on the internet all with a single touch. A single device capable of doing the work of 4 individual tools, an electronic book is a better option than a paperback textbook. Not everyone has access to every book on every subject. A few courses, certifications or examinations require course content from various books, authors and publications. This is applicable in the case of preparation for competitive exams such as GATE 2019, CAT or UPSC. It would be challenging for a student to find or buy all of these books Furthermore, borrowing the said books might be a bit difficult considering books are costly. Electronic books are more convenient to share compared to paper books. The files can be shared directly from one device to another, via the internet. This makes it much easier for students to use E-Books. For most competitive exams such as GATE or UPSC, course content keeps on changing, and students need to stay up to date at all times. While paper textbooks do provide content of the highest quality, the issue of content getting antiquated remains. A student can always buy new books and upgrade their older publications, this again is a costly affair. Electronic books make it much easier for students to upgrade their course content and books easily. An updated copy of a book from the same publication is just a simple click away. Not only that, e-books let you access the same course content in its different versions, by various authors and through multiple years of publications giving a broader scope for choice. The cost of making a paperback or hardback covered books is far more significant compared to its digital counterpart. A textbook which costs around 500-1000 rupees can be downloaded for 10X less cost, and at times, it is even available entirely for free. Initiatives such as Project Gutenberg, a volunteering organisation, aim to digitise prominent literary wonders and publish most of them into the public domain. There exist many such voluntary and not for profit entities which are a relief for the student community who can access these books for free. There is a 400% increase in the consumption of the paper around the world in the past 40 years. A single piece of A4 paper requires about 5 litres of water. A single tree is capable of providing oxygen to 3 people for breathing. Now imagine this, the Sunday edition of New York Times requires chopping down of 75,000 trees! E-books can help in saving trees and thereby protecting the environment. Audiobooks and podcasts are another great way of using digital mediums for books. While most audiobooks are available for free on Youtube, purchasing these is not much of an expense too. Audiobooks are great for students who are working and those looking to multitask. Digital textbooks are the seeds for optimising the education system. It is only a matter of time before they are completely integrated into the system. I hope you enjoyed this article about why digital textbooks and ebooks are better than paper textbooks. Interested in more articles about business and educational books?